Patriot is one of the most well-established producers of DRAMs and Flash Storages, but they do not really have the same presence when it comes to the gaming peripherals market. However, the company did establish a gaming brand under the name Viper where they produce high-end and quality gaming peripherals and accessories such as mice, keyboards, mouse pads, and headsets. Today, we’re going to focus on two popular devices from Viper namely the Patriot Viper V-570 Blackout Edition and the Viper – Gaming-LED Mouse Pad. The Viper V-570 is one of the best in the market so if you’re someone who wants quality and durable devices, then this needs to be part of your setup. Patriot utilized a design that we have already approved of, and we think that they even improved this further. As for the Viper – Gaming-LED Mouse Pad, it is one of the most adequate accompaniments to any quality gaming system; it also offers you the ability to accent and stylize your desktop with its LED lighting. Generally, the mouse pad has a rather low profile but it does feature a spacious format designed for constant movement across the biggest, high-res screens available. Patriot Viper V570 Blackout Edition & Mouse Pad Review – Whats in the Box? The company’s packaging for the Viper V-570 is actually really good since the product comes in a durable black-themed box; you’ll see a long list of details that are necessary to know more about the gaming LED mouse. On the front portion of the package, you’ll see a huge image of the device, the product’s name, as well as the Viper logo which is set at the upper-right portion of the box. On the sides, you’ll see a couple of the mouse’s features such as its 12,000 DPI laser sensor, RGB lighting profiles, its FPS + MMO hybrid design, as well as its flexible weight system. Once you open the Viper V-570’s box, you’ll see that aside from the gaming LED mouse, it includes two stickers with Viper’s logo, a documentation guide, as well as seven adjustable weights. The company has also included a little rounded box that holds the included adjustable weights. We actually liked that the USB cable features a gold plating on its connection area, and as for the cable’s measurements, it is about 1.8 meters long which is adequate enough for use; additionally, the cable is braided which gives off a more durable and sturdy feel to it. Now, let’s go on to the Viper – Gaming-LED Mouse Pad’s packaging. This product comes in a mostly black-themed box but it is somehow highlighted by the RGB LED lights. There are a total of three icons located at the bottom-left corner of the box which provides information about the backlit LED colors that you can select, as well as the presence of a rigid polymer exterior. There isn’t anything else to see in the back portion of the box but the images on the right displays the mouse pad’s optional colors which also work as modes too. In the box, you’ll first see the Viper – Gaming-LED Mouse Pad which is protectively wrapped in a plastic sleeve to avoid any damages; beneath the mouse, you’ll find the pad’s six-foot power cable and the cycle colors & modes. The cable also features a 2.0 USB on one end and the micro-USB connection on the other, and what looks like a choke in line on the mouse pad’s cable is actually the device’s controller. The last thing that you’ll see in the box is the user manual. The original model of the Viper V-570 featured a lot of plastic and numerous flashy red buttons; however, Patriot decided to change this. So today, you will see that the Patriot Viper V-570 Blackout Edition has been blacked out completely just as the name states. The new design actually looks much better and sleeker so we’re giving Patriot a thumbs-up for the mouse’s exterior. The device features a total of thirteen programmable buttons which is a lot even for a gaming mouse; though we aren’t complaining at all since these are quite useful for any gamer. On the mouse’s left portion, you’ll see five side switches and the sniper mode button; however, each of the switches available are completely programmable, so how you setup the device is all up to you and your needs. When it comes to gaming, the biggest advantage is by having your shortcuts and macros within easy reach so having the sniper button in its place is definitely a good thing. If you decide to setup this button to drop the DPI while you’re holding it down, you can expect the best edge in performance for scoped headshots in various FPS games. When it comes to the Viper V-570’s exterior, it features a classy ergonomic design so you can easily press your thumb right on its left portion while the right side has nicely-made curves to provide comfort and adequate grip. Don’t worry about the design; when we tried using the mouse, it worked well for us and even through prolonged gaming, the mouse’s design didn’t limit us in any way and we didn’t feel any discomfort while using this. 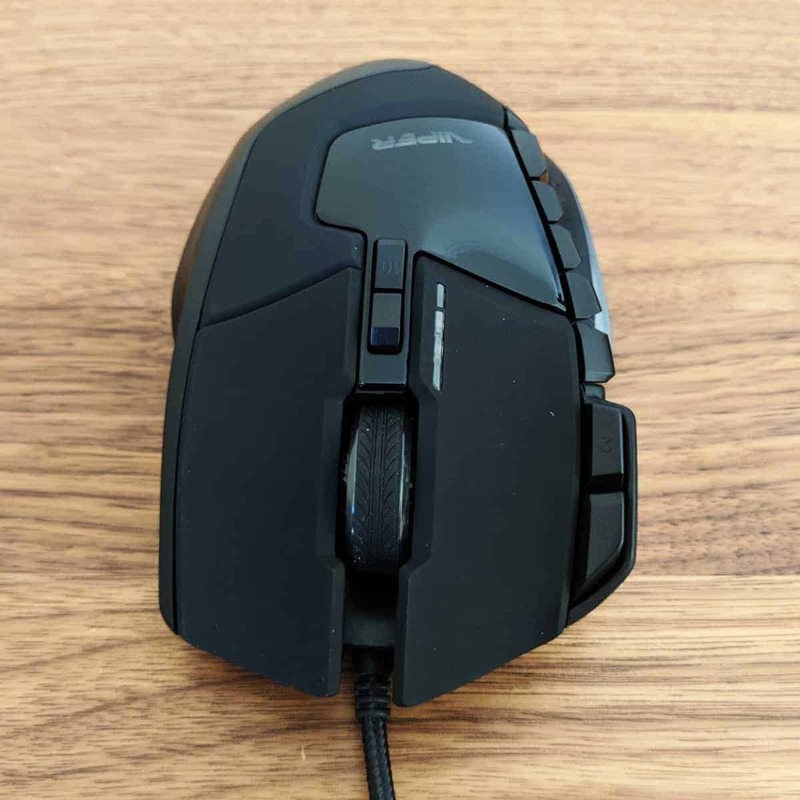 The Viper V-570 also features a huge and weighted scroll wheel which actually feels nice to the touch; we also liked the fact that it has a nice click to it every time we pressed this. Behind it, there are two additional buttons that are also programmable – these are, by default, DPI up & down; however, you can still set these buttons up however you want. If that still isn’t enough for your needs, there are two more additional wing buttons located beside the LMB. You can actually set these to block or melee for a couple of games and that actually works perfectly. We think that one of the best features of the Patriot Viper V-570 Blackout Edition is the weight-tuning system; the weight of the mouse actually depends on your preference but we also liked the weights for a more fluid movement while gaming. If you want to keep things lightweight, just leave the weights out and you’ll get a very light V-570 which is also perfect for twitchy shooting games. These weights are also positioned over the mouse which helps you acquire a better and more balanced weight distribution. Additionally, the mouse also features edge lighting which can be found on both sides of the device, as well as on its scroll wheel and the logo. You can readily configure the whole thing via the software which is actually easy to navigate through; moreover, the mouse also pairs nicely with the Viper – Gaming-LED Mouse Pad. The Patriot Viper V-570 Blackout Edition is an upgraded version of the original V-570 gaming mouse so it features almost the same style and design as the classic device; the only difference between the two are a couple of little changes made on the Viper V-570 such as the buttons. These are now blacked out instead of appearing bright red; the cable is now also completely black instead of it having a combination of black and red. For its measurements, the Viper V-570 Blackout is about 5.2 inches deep, 1.7 inches in height, and is about 3.2 inches wide; as for its weight, it is almost 160 grams. The Patriot Viper V-570 Blackout Edition also supports a lot of the modern features that a lot of the gaming mice come with and these include the following: it allows you to readily customize the RGB lighting on the device and you can also select from a variety of color zones which is pretty cool. Aside from this, it also comes with a total of thirteen micro-buttons that are programmable based on your needs and preferences. The company also ensured to utilize the Omron button switch as well as equipping the Viper V-570 Blackout with the ADNS 98-00 laser sensor from Avago. Omron is actually a well-known Japanese company that creates some of the best mouse button switches in the market. The Viper – Gaming-LED Mouse Pad is the best accompaniment for every gaming system and it also lets you stylize your gaming spot with cool RGB lighting. The product is wide enough to let you play seamlessly without breaks across high-resolution and huge monitors. The mouse pad is made from a high-performance and quality polymer surface that offers you a smooth and durable exterior to further maximize the performance of your quality gaming mouse. Its rubber grip back covers the entire bottom area of the mouse pad to ensure that your mouse pad won’t slip or move unnecessarily during intense gaming moments. The gaming LED mouse pad also features six LED light zones that give you non-stop backlight on the whole mouse pad. The mouse features seven LED lights where each of these can be individually utilized using preset modes to provide eye-catching RGB LED accents. These are specifically made to accommodate your MMO and FPS needs; the Viper V-570 features a total of thirteen programmable buttons that offer you unlimited and excellent control depending on your preferences and gaming needs. The X-Treme Precision Laser sensor utilized is the ADNS 98-00 and this sensor is specifically made to max out at 8,200 DPI; yet with the assistance of the software, Patriot can definitely increase the limit to 12,000 in total. The Patriot Viper V-570 Blackout Edition features four ceramic mouse skates which prevent any form of delays; plus, there are also Omron swatches located beneath the device’s main buttons. The company also exhibits the fact that they utilize a Sonix MCU which is considered as the heart of this device. The company ensured that comfort is one of the highlights of this device though it is primarily aimed for palm-grip gamers. Its deep thumb groove combined with its perfectly-shaped edge for your fourth and fifth finger allows you to use this device for prolonged periods without having to worry about discomfort and such. This is a vital factor for a lot of gamers (especially MMO players) since gaming action can go on for long hours; additionally, the device also features an eight-bit Sonix chip which is able to withstand heavy gaming tasks and basically functioned excellently. This product works adequately and we actually liked its polymer surface that allows the mouse to move smoothly and easily; it also provides a stable tracking area that worked excellently during regular computer use and of course, gaming sessions. We also liked the different lighting modes which looked uniform and solid across the mouse pad’s lower edge and there weren’t any dead spots as well which was really good. The pad’s control box that is utilized to manage the lighting was also made well so we can definitely say that the company did a very good job with the mouse pad’s build quality and form. For you to experience ultimate convenience, the company lets you manage all of your Patriot peripherals via the Viper software. It’s great that you do not really have to install the Viper software to be able to utilize the Viper V-570; however, if you want to take advantage of more features that are available, installing this is necessary. If you decide to install the software, we highly recommend that you first check if there are any firmware updates for your device. Using the software is very easy and just one press of a button will allow you to readily customize a lot of various settings such as altering the DPI levels up to 12,000. Upon launching the software, you will see the thirteen programmable buttons, as well as the five available profile settings; just keep in mind that the left click is not a programmable button but all the rest can be mapped based on your liking. Choose any of these programmable buttons and another window will pop out; here, you will be given access to the Keyboard, Mouse, Macros, Advanced Functions, as well as the Key Cycle. It’s actually pretty easy to work around the software and it also functions flawlessly which is something we really appreciated; additionally, its UI is also straightforward, clean, and user-friendly so anyone won’t have a difficult time navigating through this. The Viper V-570 is one solid and highly notable gaming mouse and we can definitely say that it is the best device for the Viper range. It can compete with any other high-end gaming peripheral and its sensors prove to be an excellent tool for any activity, may it be for gaming or work. Combine this with its fully-programmable buttons and powerful macro engine, you’ll definitely have an excellent tool especially for intense gaming sessions. When it comes to the aesthetics, Patriot has really done a great job of providing the Viper V-570 with a sleek blackout appearance and it also looks classy at the same time. We really liked its thumb-grip feature especially for continuous game-time and how your palm fits perfectly when gripping the mouse makes it even better since we didn’t experience any issues with comfort despite using it for prolonged hours; plus, the mouse’s ceramic skates are definitely better than the plastic ones which is common in a lot of mice. This allows you to move smoothly and seamlessly so no lags or breaks occurred when we used this. As for the Viper – Gaming-LED Mouse Pad, it works perfectly with the Viper V-570 and it also holds up pretty well under heavy and non-stop usage; what we liked about the mouse pad is that despite the intense gaming session, it still gave off a calm light which is actually nice especially for aesthetic purposes. Overall, we definitely recommend the Patriot Viper V-570 Blackout Edition and the Viper – Gaming-LED Mouse Pad. If you want to have your own Patriot Viper V570 Blackout Edition, you can get it from the company’s official product page for $69 $69USD; and as for the Viper – Gaming-LED Mouse Pad, you can get one for $59USD from here.